They are one of my favorite bands from the NYC area -- and if you haven't seen them play before, you are in for a real treat -- especially in celebration of Holi, the spring festival of colors! 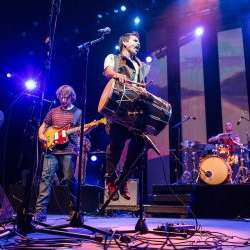 Red Baraat is a pioneering band from Brooklyn, New York. Founded by dhol player Sunny Jain, the group has drawn worldwide praise for its singular sound, a merging of hard driving North Indian bhangra with elements of hip-hop, jazz and raw punk energy. Created with no less a purposeful agenda than manifesting joy and unity in all people, Red Baraat can mesmerize an audience with a funk groove, turn a switch, and drive the same crowd to the brink of delirium. For this performance, Red Baraat is joined by Vidya Vox, a musician and Youtuber who seamlessly fuses together the intricacies of Indian music with elements of electronic and hip-hop for an undeniably catchy sound. Put on your dancing shoes for this high-energy celebration! Tickets are sold out as of Fri 01 March. Kindly remove your name from the guest list on this page, if you were unable to buy tickets in advance. General admission, standing room show. Be prepared to stand/dance the entire night. NO-SHOWS are NO FUN. Do not RSVP here if you do not buy tix first.